All the Free jQuery Plugins about 'tree view' are listed here. 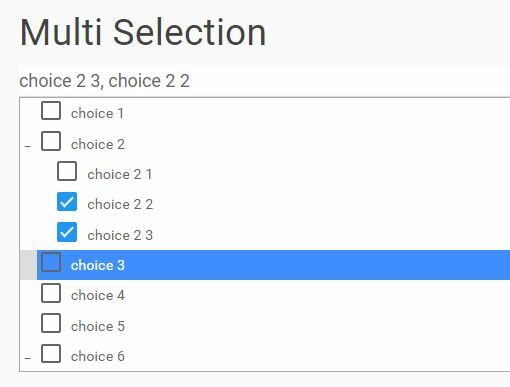 Tree Multiselect is a jQuery plugin that converts a multiple select box into a collapsible tree view with checkboxes for easy option selection. 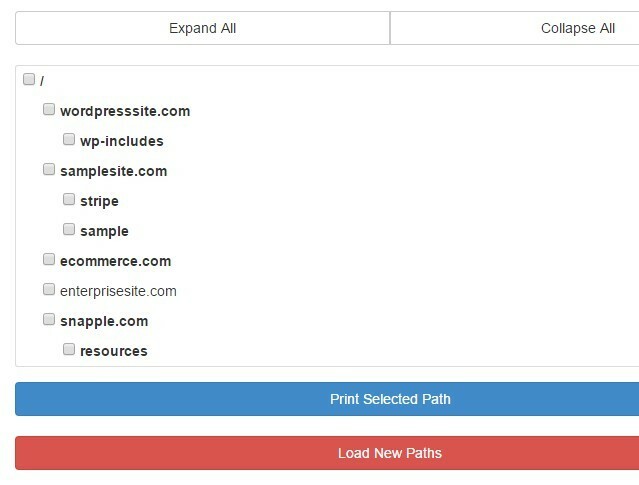 A dynamic tree select jQuery plugin that allows the user to select an item from a multi-level dropdown list similar to the collapsible tree structure. The dataTree jQuery plugin lets you generate an expandable/collapsible hierarchical tree from a group of any HTML elements. 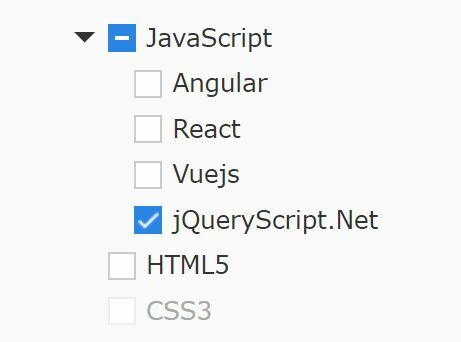 The jQuery sim-tree plugin lets you create a checkable, hierarchical tree with support for asynchronous data loading and indeterminate (tri-state) checkboxes. 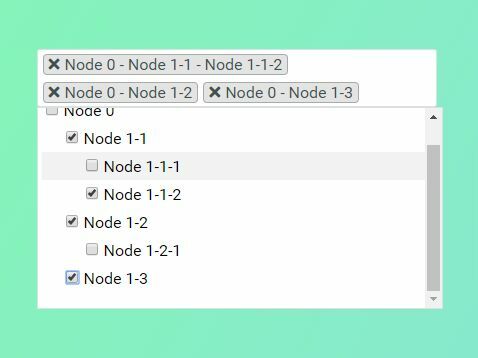 A lightweight, dynamic jQuery treeview plugin which enables the user to select multiple tree nodes with checkboxes. 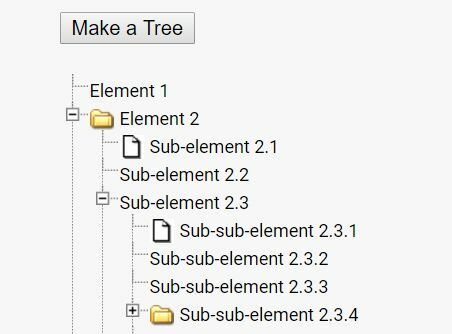 BooTree is an easy tree plugin that dynamically renders hierarchical tree structures with support for programmatical check, uncheck, collapse, expand, etc. In this blog post, you will see a list of 10 best jQuery plugins that make it easier to generate the tree view in your web applications. Have fun. The jQuery treeSelector plugin enables the user to select multiple options from a dynamic hierarchical tree structure with checkboxes. A simple, SEO-friendly jQuery tree plugin which converts nested HTML lists into a collapsible and expandable tree structure. Ideal for representing your folders, files, menu items as a hierarchical tree. Fancy Tree is a plugin for jQuery and jQuery UI that allows to create dynamic tree view controls with support for persistence, keyboard, checkboxes, drag and drop, and lazy loading. zTree is a powerful and fast jQuery 'Tree' Plugin for creating Multi-functional Folder Trees with excellent performance and flexible configurations. jsTree is a powerful jQuery plugin used to generate dynamic, interactive tree views (for example folder tree) with support for inline editing, drag'n'drop, checkboxes, keyboard navigation and more. The jQuery Flex Tree plugin presents hierarchical data in a dynamic, interactive, collapsible tree structure with checkbox and radio button support. 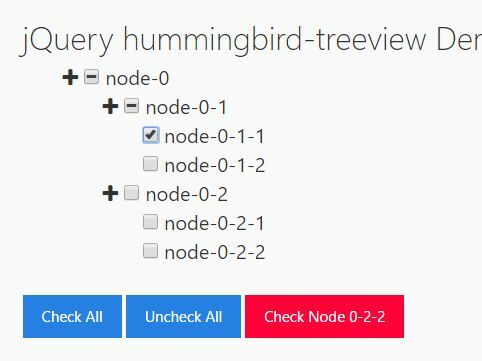 hummingbird-treeview is a jQuery plugin that transforms nested html lists into an expandable, collapsible, searchable, checkable, hierarchical tree structure. 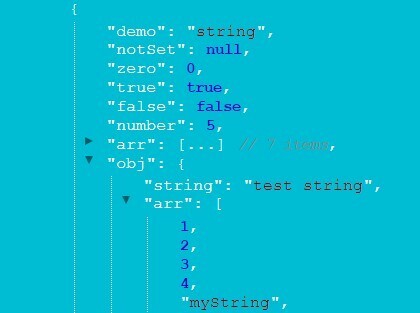 bstree is a simple-to-use jQuery/Bootstrap 4 plugin used to present hierarchical data in a semantic, collapsible tree view with checkboxes. ArtaraxTreeView is a flexible, configurable tree plugin to dynamically render a tree selection control from a JSON/JS array for selecting parent/child nodes. 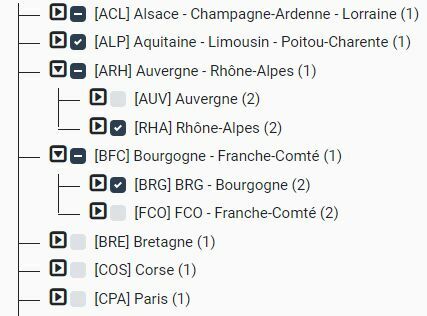 Combo Tree is a jQuery plugin to render a single or multi-select dropdown list from JSON data that enables the user to select one or multiple options from a hierarchical, collapsible tree view with checkboxes. 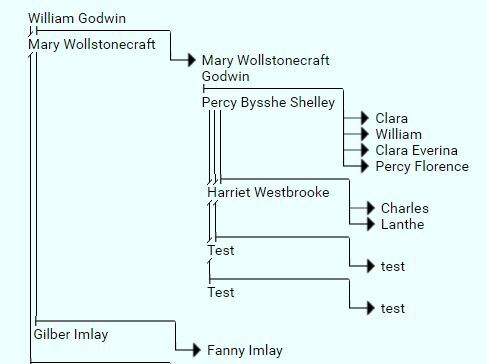 A lightweight, simple and semantic jQuery family tree plugin which helps you to draw complex family tree diagrams from nested HTML unordered lists. simpleTreeMenu is a lightweight and easy-to-use jQuery plugin used to render Mac OS Finder like folder tree, file browser or tree structure from nested HTML lists. 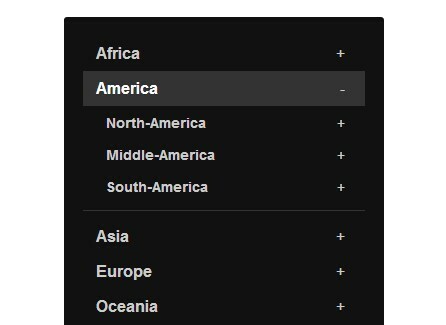 DropdownTree is a jQuery plugin that utilizes Bootstrap dropdown component to create a dynamic, multi-level, multi-select dropdown with checkboxes similar to the tree structure. A jQuery plugin that enables items in a list to be sorted vertically through drag and drop. Yet another jQuery tree view plugin that lets you create a flexible, dynamic, expandable and collapsible tree control from nested html lists or hierarchical JSON data. tsTree is a jQuery plugin used to render a dynamic, horizontal, expandable, multi-level tree for category lists, site navigation, multi-select tree lists and more. 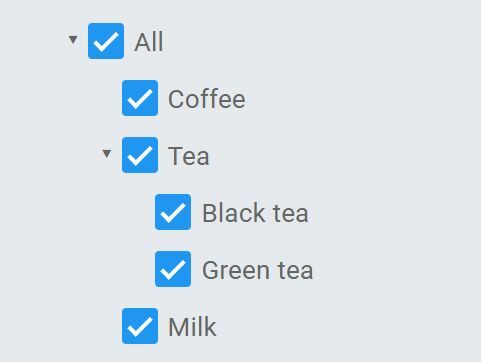 Just another jQuery based checkbox tree plugin that displays your hierarchical data in a tree structure with checkboxes. 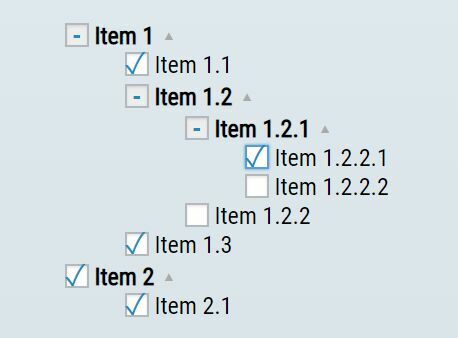 Just another jQuery checkbox tree plugin which helps you dynamically render a hierarchical tree structure with checkboxes. Treegrid is a jQuery plugin which converts a standard Html table into a collapsible data grid like the tree structure. 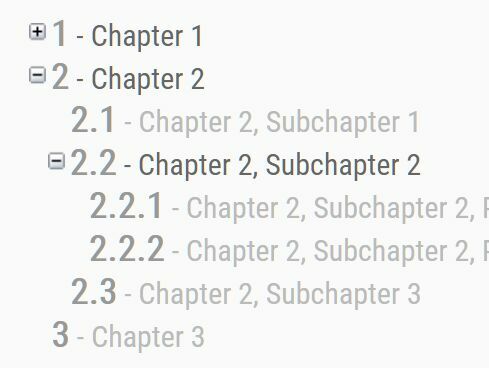 file-explore.js is a minimal jQuery folder tree/file explorer plugin used to convert nested unordered lists into a hierarchical tree that is both expandable and collapsible. jsFiler is an AJAX-enabled jQuery file/folder tree plugin that allows the user to display/edit hierarchical data in a folder structure similar to the file explorer. ctree is a dynamic, easy-to-use jQuery tree view plugin used to present your hierarchical data in collapsible, selectable, HTML5 canvas based tree structures. 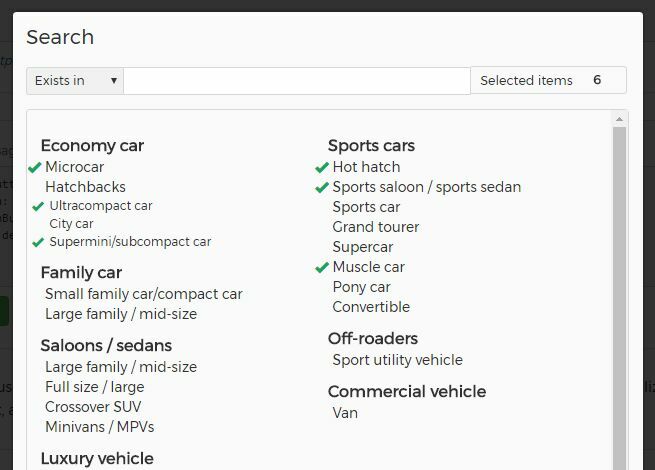 SearchAreaControl is a flexible, dynamic, user-friendly jQuery multiple select plugin which allows the users to search and select multiple items from hierarchical data in a modal popup. 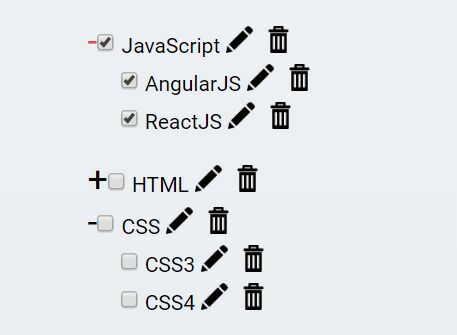 explr-js is a jQuery plugin that converts nested html lists into a File Explorer-like hierarchical tree with smooth animation and custom icons support. 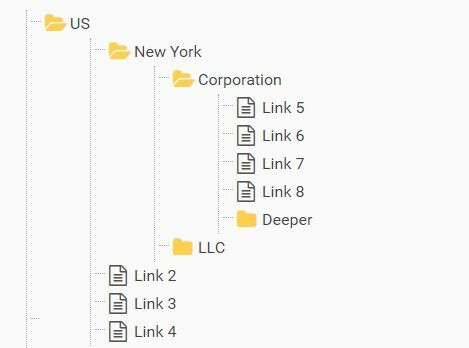 Filetree is a really small, cross-browser jQuery plugin that allows to visualize your hierarchical data in a folder structure with collapsible folders and files. treetable is a lightweight jquery plugin that allows you to display a tree of data in an HTML table that's good for creating a directory structure or a nested list. hortree is a small and easy jQuery plugin that helps render a horizontal treeview-like diagram from hierarchical data you specify in a JSON file. Treejs is a lightweight, extendable, and configurable jQuery plugin that provides interactive, AJAX enabled trees to show HTML & JSON data in a collapsible tree structure with checkboxes. A jQuery treeview plugin that helps you render a dynamic, checkable, filterable, collapsible, vertical hierarchical tree from a JSON schema. simpleTree is a lightweight jQuery plugin which generates a collapsible folder/directory/file tree from a nested html list. almightree is an easy-to-use jQuery plugin for rendering a filterable and collapsible tree view interface from large nested html lists. 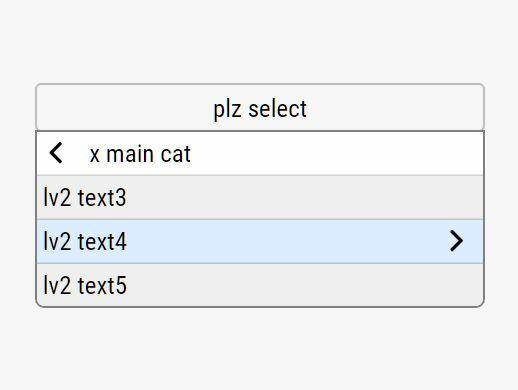 Just another jQuery tree table plugin which turns an html table into a tree, with expand/collapse buttons. 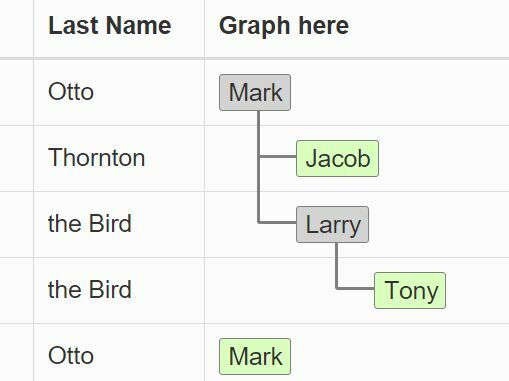 edittreetable is a jQuery plugin used for rendering a hierarchical CRUD tree table from JSON objects using Bootstrap styles. Flextree is a simple, flexible jQuery plugin used for rendering a dynamic, highly customizable tree structure from external JSON data via AJAX request. 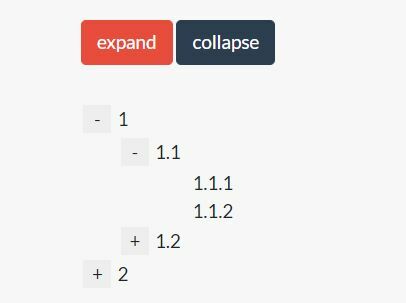 Yet another jQuery plugin which converts a nested html list into an animated, collapsible tree structure with support for checkboxes and auto expanding. Bonsai is a very small (~3kb minified) jQuery plugin which turns a normal nested list into a responsive, mobile-friendly, collapsible, hierarchical folder tree. A simple jQuery plugin which converts the JSON data into a collapsible hierarchical tree view to visualize your JSON data in a pretty way. JSONPanel is a lightweight jQuery based JSON view that displays your JSON data by transforming them into a collapsible, more readable tree view structure. jqm-tree is a jQuery tree view widget for jQuery mobile framework that helps you create a dynamic tree structure from JSON data. jsonfrill is a jQuery plugin that helps you render a collapsible, colored JSON tree view by formatting and beautifying JSON data. 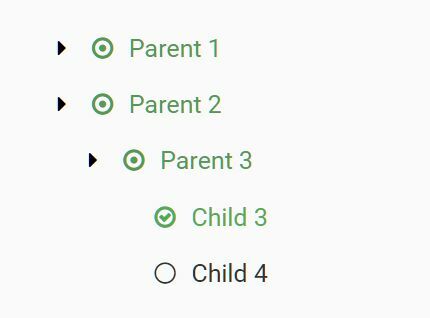 highchecktree is a jQuery plugin for making a collapsible checkbox tree that allows three check states. directoryTree.js is a jQuery plugin for displaying file paths as an interactive, hierarchical directory list (tree structure) in Bootstrap 3. TreeViewJS is a jQuery plugin that takes data from a big nested list or JSON strings and present them in a expanding and collapsing tree view. Orange Tree is a simple lightweight jQuery tree view plugin helps you create an expandable/collapsible folder/file tree structure. 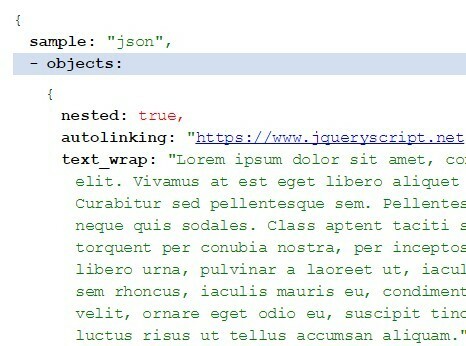 A jQuery plugin for formatting JSON data that converts JSON strings to a pretty collapsible tree view structure with syntax highlighting support. 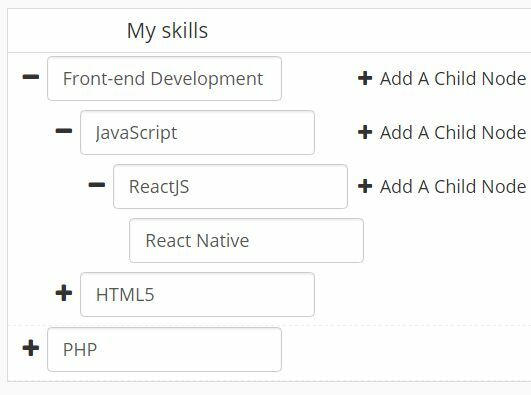 Sapling is a simple yet customizable jQuery plugin that turns a standard Html list into a tree view interface or an accordion list with sliding animations. TreeGrid is a lightweight and flexible jQuery plugin to create a tree grid component that renders hierarchical, nested and flat data in a table. Tree Filter is a lightweight jQuery plugin that takes a big nested list and transform it into an expandable folder tree structure with live search. dTree is a simple lightweight jQuery plugin for creating a classic fold/directory/file tree view structure with smooth CSS3 transitions. Nxeed Tree Menu is a simple jQuery plugin to create an accordion-style vertical tree menu that is collapsible and expandable with smooth sliding effects. mtree.js is a jQuery plugin that enables you to create an animated vertical accordion menu based on jQuery velocity.js and CSS3 transitions. 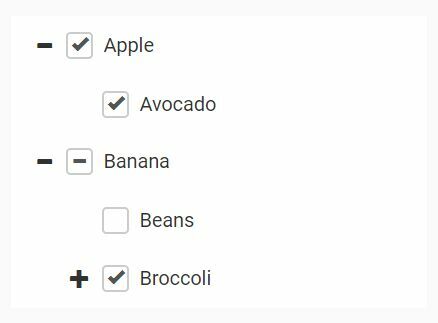 Checktree is a lightweight and simple jQuery plugin for creating a hierarchical list of check boxes. dynatree is a powerful jQuery plugin for creating dynamic tree view controls with support for persistence, keyboard, checkboxes, drag and drop, and lazy loading. Good Tree is a tiny and easy-to-use jQuery plugin for quickly and easily create a tree view user interface widget for your project. simplefolders is a simple jQuery plugin for easily create a flat folder tree on your website and web application.